To stand with a Native American friend of 40 years at the site of a desecrated ancestral grave can be a transcendent and disorienting experience. Quiet grief. No words. Very different for me than for him. For many of us, ten months of day-in-and-day-out whiplash, the feeling of reeling with every newscast, has been deeply depressing. But Monday was different. It was a punch in the gut. President Trump’s slash and burn dismantling of Bears Ears National Monument—from 1.35 million to 200,000 acres—and Grand Staircase-Escalante National Monument—from 1.9 to 1 million acres—was a gleeful attack on nature, five tribes, Obama and the environmental community. A sickening scene played out in Utah’s State capitol, right down to making Mick Jagger sing “You can’t always get what you want…” at the close of a garish and surreal ceremony. We can hope the courts will overturn Trump’s ecocidal, law-flouting actions and that judges will unanimously agree with the Hopi, Zuni, Navajo, Ute and Ute Mountain Tribes, and with the Native American Rights Fund, Earthjustice, Patagonia, REI, and everyone else who is suing the bastards. But this thinly veiled move to open the door to oil, gas, coal, uranium, fracking and all other manner of industrial invasion of what’s left of our wild public lands reveals what Trump and Zinke and their corporate sponsors are after, and how brazenly they will go about their dirty work. If you are willing to feel carsick, I recommend you watch Trump’s speech. It’s a piece of work. “Wonder and wealth…”— we can have both! 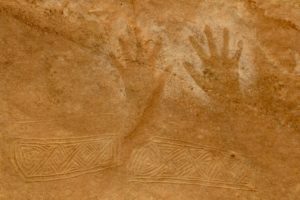 No mention of coal stripmines or motorized all-terrain boytoys or bullet holes in ancient, priceless petroglyph panels. I know many of us feel that our decades of work in the name of social and environmental justice are being vandalized by a reactionary patriarchy founded, at least in this country, on an imagined racial and religious superiority. Too true. I know for each of us there are certain days when the destruction feels closest to home, personal. I guess that’s the case for me here. President Obama’s recognition of a sacred cultural landscape to be co-managed by five sovereign tribes was an evolutionary step that everyone who has worked at and with the Sacred Land Film Project has tried to help nurture since the 1970s. Amazingly, Trump actually said: “We have seen how this tragic federal overreach prevents many Native Americans from having their rightful voice over the sacred land where they practice their most important ancestral and religious traditions.” This grammatically indecipherable comment was met with cheers and whoops as Trump pointed off camera to the handful of Navajo people who were present. It’s a sickening obliteration of the truth—so what else is new?—that totally ignores the reality on the ground in southern Utah, and I must say it made me wonder how much they paid those Navajo folks to attend Trump’s travesty. 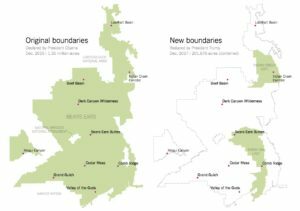 In particular, Trump railed (“I’m a real estate developer”—note present tense) at the size of Bears Ears National Monument, which at 1.35 million acres was smaller than the 1.9 million acres the five tribes had asked Obama to designate. Mr. President, cultural landscapes are big. 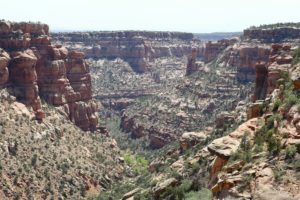 Archaeologists estimate that the Cedar Mesa area, beneath the two rocky Bears Ears that jut up in the foothills of the Abajo Mountains, contains more than 100,000 historic, cultural sites left by the ancestors of many clans that migrated through the Four Corners area over the millennia. I have visited hundreds of these sites with backpackers and native elders. It is a sacred landscape, which for years has been abused by greedy pot hunters, looters of graves, thieves with power saws who cut petroglyphs free of red cliff faces and sell them as mantle piece art. Second, there are other national monuments that are far bigger. President Calvin Coolidge created Alaska’s Glacier Bay National Monument at 1.4 million acres in 1925 (it’s now a national park and World Heritage Site), and, in 1978, Jimmy Carter designated Wrangell-St. Elias National Monument at 11 million acres. So, in sadness let the resistance continue to build. The Salt Lake City Tribune photos of last Saturday’s 5,000-person strong protest were a wonder to behold. Organized by the dedicated folks at Southern Utah Wilderness Alliance, that forceful show of creativity and spirit is a testament to our strength as a movement. Onward. 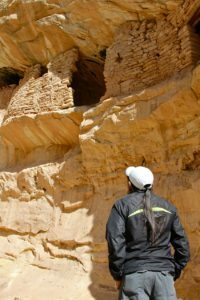 Check out a photo gallery of my 2015 visit with Hopi and Zuni cultural resource specialists to Bears Ears to witness desecrated burials and enduring artifacts in an awesome landscape, and my two other relevant blogs (It’s Time to Stand Up for Bears Ears and Hopi and Zuni Visit Bears Ears). Check out Friends of Cedar Mesa—doing great work in Bluff, Utah. Read the Native American Rights Fund lawsuit on behalf of the Hopi, Zuni, Navajo, Ute and Ute Mountain tribes. Support the Bears Ears Inter-Tribal Coalition and Utah Dine Bikeyah with a year-end donation.